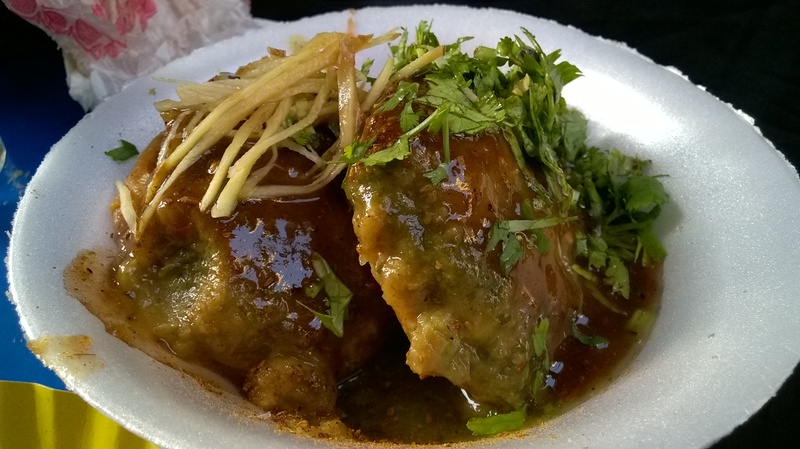 Chhole have distinct taste at each chhole kulche joint. At one end of this spectrum, Lotan’s Chhole Kulche at Chhata Shahji in Old Delhi adds red chilies to make it spicy and hot, while at the another end there are a few eateries like Pancham Chhole Kulche, near Filimistan, Rohtak Road that makes a nice mixture of saunth or meethi chutney with khatti chutney in chhole to give it a distinct flavour. I have never liked onion and tomato in my dona of chhole. I believe that chhole has its own unique taste which is lost once onion and tomato are added to it. In Kamla Nagar, near Chhota Golchakkar, Post Office Waali Gali, a small shop named Trishul Chat Bhandar, sells one of the best matra kachoris and matra kulchas in North Delhi without onion and tomato. The address is 121-D, Kamla Nagar. 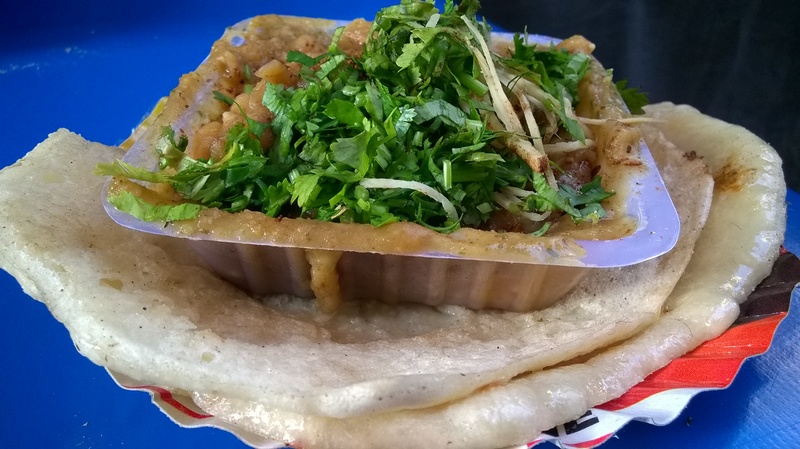 The shop is open from 12 noon to 4 p.m.
A plate of chhole kulche and matra kachori costs Rs. 25 each. As suggested by the owner of the shop, I first had chhole kulche and then matra kachori. I was intrigued by his suggestion and asked him the reason behind having chhole kulche first and matra kachori next. He candidly replied that khatti-meethi chutney is added in matra kachori, and its taste can be relished only if one has it right after the light masalas of chhole kulche. I was surprised to know that they have been making this delicious dish for the past seventy-two years and currently, it is the fourth generation, and that they still use the same recipe. It was started by Ramful who used to roam around the lanes of Kamla Nagar to sell chhole kulche on a khomcha. After the death of Ramful, Tula Ram bought a cart and started selling the chhole kulche near Kamla Nagar Post Office. And the third generation, Krishan Lal, who is the current owner of the shop, bought this small shop eight years back, calls it “Almirah” because of its small size. 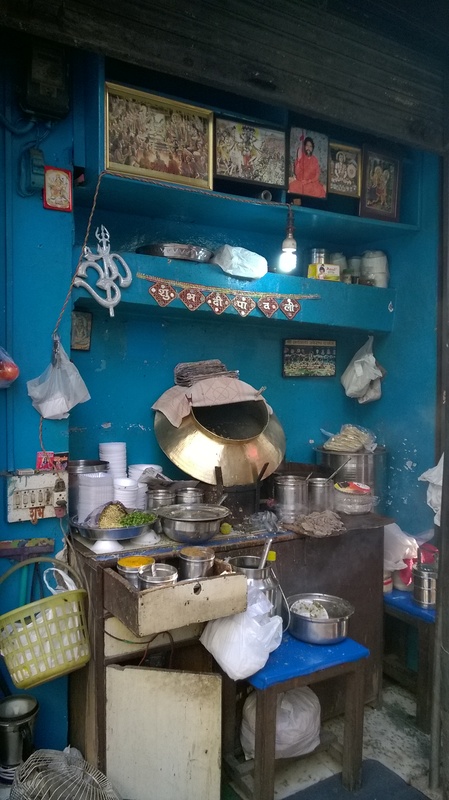 It is indeed a small shop of literally the size of a cupboard and I love the way they have arranged everything from masalas to the stove there. From khomcha to a cart to an almirah, the place and those who made this delicacy have changed, but the recipe is still the same. The home made masalas- which are mixture of dhaniya, jeera, amchur, peeli mirch, long, elaichi dana, and chaat masala are used in making a dona of chhole. A helping of chhole is mixed with masalas, saunth, green chutney, roasted jeera, ginger, and coriander to be served with butter kulche. On other hand, Pawan, the son of Krishan Lal, generously makes a good layer of matra on a crispy kachori and tops it with ginger, coriander, and khatti amchur chutney. The crunchy kachori with soft matra over it with lime juice, khatti-meethi chutney makes it a perfect dish to savour. All I can say, it is a taste of the divine!